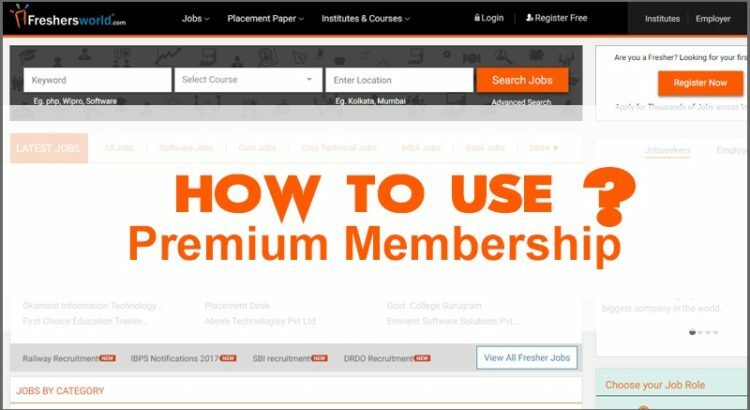 Now that you have successfully made the payment and taken the premium membership on Freshersworld.com, let’s look at some of the ways in which you should be using your premium membership to maximize your chances of landing a new job. There’s many ways in which you can use the premium membership and these are just some of the standard methods of use. But ultimately, the choices are yours and yours alone. Now let’s talk about what you can do. 1. Ensure your profile 100% Complete. This is easily the first thing that you should start doing when you become a premium member. Now your profile should be at 100% completion. No?? Check if you missed something. If everything looks good and you’re still not at a 100%, then it may be something very minor which you may have overlooked. With premium membership come premium jobs. These jobs are the ones which offer a relatively high salary and are also probably exclusively hiring through Freshersworld.com. Sound good? Well it gets better. Not only can you apply for these jobs, you also get priority in getting shortlisted for all jobs that you are eligible for. Being a part of Premium Club, you get assessed on Aptitude, Technical and Communication Skills and you will become a part of Pre-assessed pool of candidates with your CEAT Score. Your CEAT score will be made available for all companies. Improves your confidence to face your next Walk-ins. Your profile comes up on top while companies searches for candidates. There’s a couple more things too but I’m not really into writing listicles so let me just give you an understanding in brief. One is that you get higher priority in getting shortlisted for all jobs that you are eligible for and the other is that you will be able to receive daily job alerts to keep you updated with all the latest jobs and ensure that you don’t miss any opportunity that comes along. Well that just about covers all the services and features of the new Premium Membership. Seems like a lot to digest doesn’t it? Not to worry; each one has its benefit and completing it all will take you that much closer to landing your dream job. So what are you waiting for? You’ve already paid for it. So go ahead and use it.